Researchers at Joseph Fourier University in Grenoble, France, have found that coating a cobalt film in graphene could double the film's perpendicular magnetic anisotropy (PMA), so that it reaches a value 20 times higher than that of traditional metallic cobalt/platinum multilayers that are being researched for this property. 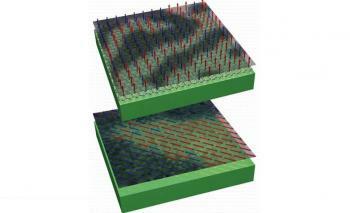 In a material with a high PMA, the magnetization is oriented perpendicular to the interface of the material's layers. High-PMA materials are being researched for their applications in next-generation spintronic devices, such as high-density memories and heat-tolerant logic gates. A major goal in developing spintronic devices is to reduce the size of the devices while achieving long-term information retention of 10-plus years. In order to do this, the storage material must have a large PMA. Enhancement of effective PMA could be achieved either by increasing the surface PMA or by minimizing the saturation magnetization of the storage layer. These co-graphene heterostructures benefit from both these properties. The PMA enhancement in the graphene-coated cobalt films originates at the atomic level, where graphene affects the energy of cobalt's different electron orbitals. The graphene coating changes how these orbitals overlap with one another, which in turn changes the direction of the cobalt film's overall magnetic field: some of the magnetization that was originally parallel to the film surface is now oriented perpendicular to the film surface. The graphene-coated cobalt has another advantage - the film can be made significantly thicker than other high-PMA materials. Typically, high-PMA materials can only be five or so layers thick before their perpendicular magnetism spontaneously starts to reorient itself in the parallel direction. The researchers here, however, demonstrated that graphene-coated cobalt can maintain its perpendicular orientation even at 13 layers thick. The researchers hope that these results will make graphene-cobalt structures promising candidates for future spintronic devices. They plan to continue investigating other high-PMA materials in the future.